Modelling annual shoot development processes is a key step towards functional–structural modelling of trees. Various patterns of meristem activity can be distinguished in tree shoots, with active periods of phytomer production followed by rest periods. This approach has seldom been integrated in functional–structural tree models. 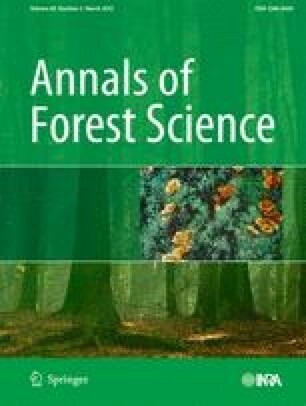 This paper presents theoretical research work on modelling and computation of the dynamics of tree annual shoots using stochastic processes with various development patterns: continuous or rhythmic, monocyclic or polycyclic, “seasonal” or “a-seasonal”, with preformation or neoformation produced from meristem functioning. The renewal theory is used to compute stochastic aspects of phytomer production, resulting from meristem extension or rest periods and meristem mortality. Continuous development can be modelled with a Bernoulli process, while rhythmic development is modelled by alternation between extension and rest periods, the duration of each period following specific distributions. The application of such stochastic modelling is the estimation of organ production during tree development as a component of the demand in functional–architectural tree models, used for computing biomass production and partitioning. Philippe de Reffye: developed the mathematical equations related to renewal theory and supervised the work. MengZhen Kang: developed the simulation method of the model applied to tree structure. This work is part of the PhD project of Jing Hua, who developed the computer programmes for the model implementation. Daniel Auclair: was in charge of the model applications and co-supervised the work. He edited the English version of the manuscript. This work was undertaken as a collaborative work within the LIAMA (the Sino-French laboratory for computer science, automation and applied mathematics) with funding from the Natural Science Foundation of China (grant numbers 31170670), Zhejiang Tengtou Landscape Co. LTD., CIRAD, and INRA. Apical meristems contribute to axis development by adding new phytomers step by step. The functioning can be continuous or rhythmic. In the continuous case, phytomers are added one by one without a significant rest period. The cumulated number of metamers in an axis is generally proportional to the daily sum of temperatures (“thermal time”). Many plants have a development following this pattern (tomato, maize, cotton, coffee). In the rhythmic case, the meristem alternates between extension periods and rest periods; as a result, an annual shoot is made of GUs that are sets of phytomers built during the same extension period. The GU can be issued from preformation or neoformation (see Sec. 4.2). During the rest period of the meristem, generally a bud is built containing embryos of future phytomers. Rhythmic development can be monocyclic or polycyclic. In the monocyclic case, only one GU is produced each year. The extension of GUs (often from preformation) usually ends in spring, and the rest period will complete the year. In the polycyclic case, the annual shoot can be made of several GUs. There can be two different modes in rhythmic development. In regions with a marked seasonal difference (temperate regions or regions with marked dry and/or rainy seasons), the development of the axes is periodic: each year, the meristem extension ends by a rest period and then starts again (in spring). The development of all axes is synchronized. Inside a year, the development can be monocyclic or polycyclic, depending on the climate and mainly temperature: Pinus sylvestris is monocyclic in Finland, whereas it is polycyclic in Southern France. So there are rhythms at two different time scales: inside a year or between years. In regions with no marked seasonal difference (tropical or equatorial, named here a-seasonal), meristem functioning can last all year round with or without a rest period, so there is no boundary of yearly development. Polycyclism can be indefinite and flushes can be asynchronous according to physiological age of branches. Preformation is common in the case of rhythmic development when a bud is formed during a rest period, as observed in beech or poplar. The flush, or the simultaneous extension of all organs in a bud, generates a GU named preformed part, which can be followed by several months before the next flush. On the other hand, continuous functioning of meristems gives birth to a neoformed part. For some particular tree architectures, such as elm or poplar, it can take place immediately after the extension of the preformed part. The analysis of tree architecture according to botanical considerations was initiated by Hallé et al. (1978). The entire plant architecture is under control of the meristem functioning as introduced above. The branching pattern can be monopodial or sympodial. Axes with the same development history can adopt different kinds of morphology and behaviour, being plagiotropic or orthotropic. The combination of different botanical traits leads to the notions of architectural model and reiteration. Barthélémy et al. (1989) refined the notion of architectural model into that of “architectural unit” that describes the type of axis for each branching order, which is the support of tree organization. The level of differentiation of the terminal meristem that gives birth to different types of axes is named “physiological age”. Physiological age accounts for the main gradients of axis organization in the tree architecture. These changes in meristem functioning can be represented by the “reference axis”, a single theoretical graduated axis, which successively takes all the possible morphological differentiation stages of GUs according to their physiological age (de Reffye et al. 1991a, 1995; Barczi et al. 2008). As an illustration of the use of the renewal theory applied to meristem functioning, Figure 7 shows the distributions resulting from two different inter-arrival laws, a binomial and a shifted geometric law, with the same mean and variance: m = 6, v = 2. We can observe that the results from the simulation and those computed from the counting laws fit very closely. These results show that the prediction of the renewal theory are very satisfactory and the choice of the Bernouilly process to compute the counting law as a binomial law appears as a relevant simplification.